Friday 18th March 1966 – David Bowie and backing band, The Buzz, make a ‘promotional’ appearance at the opening night of The Target Club in Paul’s Row in High Wycombe. A 19 year old Bowie had been signed by Pye Records in November 1965 and his appearance in High Wycombe was part of a series of shows to help push his career, particularly his single release of January 1966 – ‘Can’t Help Thinking About Me’. It failed to make the UK or US charts. His following single, released on 1 April 1966, ‘Do Anything you Say’ was the first to simply credit Bowie as artist and writer. That failed to chart too. The advert in the Bucks Free Press for the Target Club gig announced a reduced admission charge on the night of 5/- (25p). Membership was 2/- (10p). The Target Club was hosted in The Memorial Club above the Co-Op shop on the West side of Paul Row’s in High Wycombe and next to The Swan public house (a former meeting place of Wycombe Wanderers in the early 1900’s). The picture below from the SWOP wesbite shows the Co-Op building and The Swan. Both these premises were demolished as part of the Town Centre redevelopment in 1968. 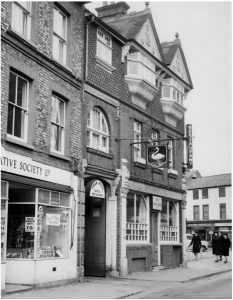 The Co-Op was relocated to the larger premises on the opposite side of the road, next to The Falcon. The web page includes some further information on the evening. Does anybody remember this club or Bowie’s appearance?